From a single dashboard, Attendify makes it easy for users to manage their events, whether small forums or big corporate conferences. Its private networking functionality that allows attendees to connect with other attendees drive engagement and communication and empowers users and attendees to create a thriving social community. Attendify makes it easy for organizers to gather real-time feedback, analyze indicators, keep everyone on the same page, and provide sponsors with ROI that can be measured easily and effortlessly. 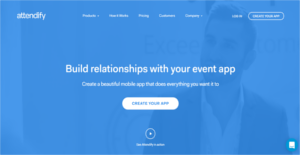 Attendify delivers you a user-friendly event app builder that lets you create the app to manage your events, capture leads, grow your business, and more. The process of building an app is already an easy journey even for novice users. You just pick the event features you want with its drag and drop interface, enter your content, preview and make the necessary adjustments, and then publish your app. You basically have an event app that does everything you want or needs. Like enhance attendee networking, providing everyone with updates, collect feedback in real-time, and more. Attendify provides a private network environment for your attendees where they can easily post and share pictures, provide updates through posts, get the prevailing sentiment on a certain topic through polls, and directly communicate and engage other attendees through private messages. Such functionality empowers everyone to become more proactive and engaging, helping companies and event organizers gather feedback and discover powerful, high-value insights that can help them move their business forward. Attendify’s ROI tools allow you to fully quantify engagement and discover key personalities who have influenced your event. With metrics and other indicators, you can easily gauge the overall sentiment of your attendees in a snap. For your sponsors, you can easily get them real-time analytics and determine which ads are the most popular and which ones are subpar. If you are considering Attendify it may also be beneficial to investigate other subcategories of Best Event Management Software listed in our base of SaaS software reviews. Every enterprise has different needs and requires a system that can be personalized for their size, type of staff members and buyers, and the specific industry they are in. For these reasons, no software can offer perfect functionality off-the-shelf. When you search a software product, first be sure what you need it for. Read some Attendify reviews and ask yourself do you want basic tools or do you require sophisticated features? Are there any industry-specific tools that you are looking for? Obtain the answers to these queries to help your search. There are multiple aspects that you need to mull over and these include your budget, specific business requirements, your organization size, integration requirements etc. Take your time, use a few free trials, and finally select the platform that offers all that you need to improve your firm effectiveness and productivity. How Much Does Attendify Cost? We realize that when you make a decision to buy Event Management Software it’s important not only to see how experts evaluate it in their reviews, but also to find out if the real people and companies that buy it are actually satisfied with the product. That’s why we’ve created our behavior-based Customer Satisfaction Algorithm™ that gathers customer reviews, comments and Attendify reviews across a wide range of social media sites. The data is then presented in an easy to digest form showing how many people had positive and negative experience with Attendify. With that information at hand you should be equipped to make an informed buying decision that you won’t regret. What are Attendify pricing details? What integrations are available for Attendify? If you need more information about Attendify or you simply have a question let us know what you need and we’ll forward your request directly to the vendor.